The aquaculture sector is growing, with fish farming being a key way to ensure Europe gets the quality food it needs without exploiting marine resources further. One key problem the industry faces is how to get the immature fish though their first few months – one EU project may be about to smooth the way. Aquaculture is a growing market within the EU, bringing employment and providing a sustainable source of fish at a time when our marine life is under pressure. The main bottle-neck for the production of marine fish is the juvenile phase, especially during the time in which live diets are used. Even the established species, sea bream and sea bass, have a very low survival rate with an average of 25 percent. For new species in aquaculture, such as amberjack and tuna, the mortality is even higher. 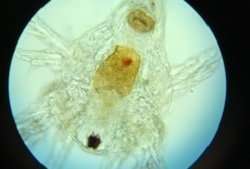 The natural first feed for most fish larvae is crustacean nauplii, the offspring of many types of crustacean zooplankton. Fish larvae is evolutionary adapted to such a diet, and it is believed that this type of prey fulfils the fish larva's nutritional requirements. Planktonic AS, the company behind the CryoPlankton2 project, has developed novel and game-changing techniques to use marine crustacean nauplii, CryoProduct, both commercially and sustainably. They have discovered a way to cryopreserve the nauplii in large user-friendly entities, and to revive them as live individuals after thawing. "Our overall vision was to upscale, pilot and commercialise the innovative CryoPlankton production process for cryopreserved marine crustacean nauplii. This can replace conventional live feeds used at marine hatcheries," explains lead researcher Dr. Nils Egil Tokle, of CTO Planktonic AS. A large-scale, industrial trial showed that the vulnerable period during which larvae consume live feed could be greatly reduced in comparison to the time needed when the fish juveniles exist on diets commonly used at marine hatcheries. "Traditionally, juveniles often display a high rate of deformities. These fish have a low market value and must be sifted out manually before going into sea cages," explains Dr. Tokle, citing sub-optimal feed as being the main reason for the low quality of juveniles. The rate of deformities in the last trial was extremely low, at less than 2 percent. However, Dr. Tokle is quick to point out that although the usual rate is far higher, the controls were also low so there was no statistical difference. "We do have strong indications that deformities are reduced, but we can't yet make that an absolute claim," he explains. The project managed to scale up production more than they had estimated initially, producing more than 8 tonnes, and protocols developed at end-users' hatcheries resulted in fish juveniles which showed 50-100percent higher growth rates and far higher rate of survival compared to the control treatments. The produced fish juveniles were better quality, with low deformities and high stress-resistance. Along with the benefits arising from the quality of CryoPlankton, the project has found a way of making the process more environmentally-friendly by reducing the amount of plastics normally associated with the process. "This is also much easier to use," says Dr. Tokle. In the past, the hatcheries had to take out pouches of feed from a dewar flask (a double-walled flask of metal or silvered glass with a vacuum between the walls, used to hold liquids at well below ambient temperature). "This which was a difficult task considering that the temperature inside as -196° Celsius. In addition, it was difficult to open the pouch as it became brittle in the liquid nitrogen." Their system is also more efficient: it uses just one unit to thaw, wash and revitalise the nauplii which means it is more practical to undertake at the end-user's location. The whole process takes just half an hour a day. "Conventional live feed diets," explains Dr. Tokle, "require a lot of time and considerable skill." But however good the feed, its use has to be simple and distribution smooth. "We were also pleasantly surprised to see that delivering the product was relatively straight forward," explains Dr. Tokle. The team sent out containers full of CryoPlankton to Greece, Portugal and Malta with no hitches. "We used ordinary road transportation; there is no need for any special logistical effort." The team believes CryoPlankton can help the aquaculture industry to overcome problems such as growth, survival, vitality and stress-response. "One of the reasons for high mortality is the presence of pathogenic bacteria in conventional live feed diets. No pathogens have ever been detected in CryoPlankton, and fish producers have even medicated infected fish larvae with our product," Dr. Tokle says.